Teacher Tom: ". . . But He Doesn't At School"
Yesterday, Mason arrived at school with a Lego Teenaged Mutant Ninja Turtle. He had brought it for show and tell, saying, "At home Donatello has a weapon, but he doesn't at school." Later, at the art table, he worked quite hard gluing together wine corks and craft sticks. When he was done he showed me his work, "At home it's a bow and arrow. At school it's a water bow and arrow." And yet later, as he stood in front of his classmates describing one of his crayon drawings, he said, "And this is the pocket where he keeps his sword . . . at home. At school he uses it to keep his water sword." After more than a decade of the children, on their own initiative, choosing to ban pretend weapons in our 3-5's class, this year's group has so far stopped short, banning only real weapons and the act of "pointing pretend weapons at other people." But last year, the class did enact a ban, and Mason was in that class, which is what he was navigating yesterday: his memory of the ban. 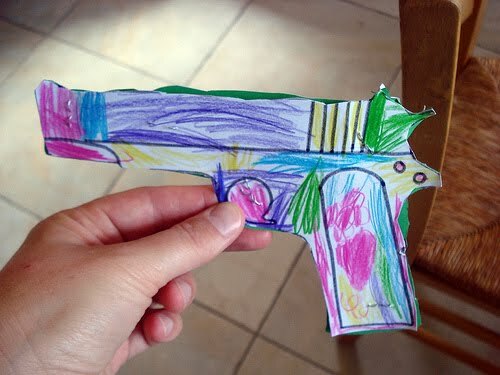 The truth is that we've had very little weapons play in the class this year, which might be why no one has found a need for further rules on the matter, but weapons are clearly on at least one boy's mind to the point that he is driven to explore them through his imaginary and artistic play. He's also obviously a guy who likes to abide by the agreements he's made (or thinks he's made) with his friends. It's wonderful, I think, how he's found a place for himself that satisfies these apparently opposing desires. In our 5's class, where the weapons play more often takes the classic form of a full body, vaguely threatening exploration with sticks and shovels and whatnot being swung around in ways that look dangerous to adults, I've found that it's often possible, when it gets too intense, to let the air out of it by re-directing the play, saying something like, "Hey, we're making light sabers at the workbench," or "I'm going to paint a cannon at the art table." Even if neither of these statements are technically true in the moment I speak them, they will be the moment we arrive on the scene: after all, everyone knows that anything can be made into a "weapon" and often we do, cobbling together our arsenal from odds and ends, paint and glue, usually talking our way through our processes aloud. I remain uncomfortable with weapons play. I wish it didn't happen, but it does. I suppose what occurs in preschools right around the world, whether pushed underground by strictly enforced rules, allowed to flourish out in the open, or existing in the kind of fluid gray area we have at Woodland Park, is just a reflection of the complicated relationship our war and peace loving societies have with them. This is something children, at least our boys, need to work out, and they will work it out one way or another, even if Donatello is forced to leave his weapons at home.